For more than 50 years, the Carlisle Garden Club has awarded a scholarship for any Carlisle student entering higher education. Preference is given to students who have an interest in the following fields: Botany; Landscape Architecture; Horticulture; Forestry; Farming, Conservation; Entomology; Ornithology; and Environmental Studies or related areas. The amount available in any given year has varied according to the available funds, as approved by a vote of the membership. When member Ann Wright's daughter Debbie died in 1966 at the tragically young age of 13, the club organized a bulb sale to institute a scholarship fund in Debbie's name. Although that sale has since been replaced by other fundraisers, the scholarship is still an important club priority. For more than 50 years, the club has awarded scholarships to Carlisle residents to help them defray the first year of college costs. 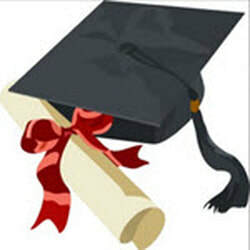 Scholarships are currently available to Concord-Carlisle High School (CCHS) graduating seniors, as well as graduates from the regional vocational-technical high schools or private schools. After the fund was established, Ann Wright served as the club’s president in 1967-68. The fund was amplified with family donations after Alan G. Wright’s death in 1986. Upon Ann’s death in 2014, her surviving daughter relayed a request that donations in memory of her mother be directed to the fund. The fund is administered by Garden Club members, who review applications and interview prospective recipients. Some past chairs of the scholarship fund are still affiliated with the club: For example, lifetime member Sylvia Brandhorst (a member since the club's inception) chaired in 1975-76. The current chair is Jane Coleman Williams. The 2019 award of $2500 is available to Carlisle residents who attend either public or private high school or are being home-schooled. The current application form can now be downloaded from this website; it can also be picked up at the Carlisle Town Hall or Gleason Library. Applicants interested in studying topics listed at the top of this page are especially encouraged to apply. The application must be submitted on or before May 1st. Any questions should be directed to Jane Coleman Williams at 978-369-7601. Members of the community are encouraged to support the fund. You can use the Donate button below to make a tax-deductible contribution that increases the amount of the scholarship. If you prefer to send a check, please address it to the Carlisle Garden Club, PO Box 231, Carlisle, MA 01741 and specify Debbie Wright Scholarship Fund on the memo line. …Maeve Devlin, a 2018 graduate of Concord-Carlisle High School​ who will enter Colby College in the fall. Maeve plans to major in Environmental Science, Geology and Agriculture. Her undergraduate education and research will lead toward a focus on paleoclimateology, which is the study of ancient climate. By using the past to inform the future, she hopes to understand how we can adjust to global warming and help plants adapt to the new environment. The goal is to provide food security for future generations. We congratulate her on winning the Debbie Wright scholarship. Throughout her high school years, Maeve actively sought out volunteer experiences and training to further her knowledge in this area. In her freshman year she was introduced to organic farming and food sustainability through her work at Gaining Ground. In the fall semester of her junior year she attended the Chewonki Semester School in Wiscasset, Maine where she continued her interest in organic farming by working in the vegetable garden and caring for the animals. Maeve went on to spend a month during the summer of her junior year on a farm in Ireland as part of the Wwoof (Willing Workers on Organic Farms) Program. When she returned home she worked at Hutchins Farm until they closed in November, and she plans to work there again this summer. We wish Maeve a rewarding and fulfilling college experience and a successful future. According to available club records, the following students have received scholarships from the Debbie Wright fund.